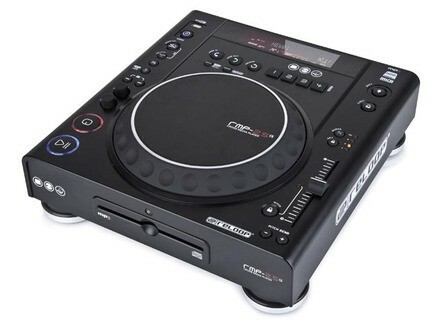 RMP-2.5 Alpha, Tabletop DJ player from Reloop. The Reloop RMP-2.5 Alpha is the latest member of Reloop's RMP-series and a cross media player with additional MIDI function. Besides playing current audio formats such as WAV and MP3 from CD, CD-R, memory stick or hard disk drive, it is also possible to control a MIDI compatible DJ software (for example Traktor) thanks to the RMP-2.5's MIDI compatibility. All the user interface's control elements send out MIDI commands. Via the shift function all control elements are double assigned with MIDI commands which makes it possible to control two virtual decks with only one RMP-2.5 Alpha. The assignments can be stored as MIDI presets for various purposes. No matter whether audio or MIDI, with the touch sensitive jog wheel, the control feeling is designed to be vinyl-like. Its micro pitch of up to 0.02% allows pitch adjustments and bending. The shockabsorbing bearing of the device's feet, as already known from the RMP-3, is designed to secure the RMP-2.5 from getting out of place. The RMP-2.5 disposes of some new features: In order to play music from one USB source on two players the RMP-2.5 Alpha comes with the possibility to be connected to a further RMP-2.5 Alpha via USB audio link. Also you can use the Data Base Builder software to analyse the desired USB drives, thus obtaining filtered results. Another feature is the Next Track function: During playback you can select the next track. The Reloop RMP-2.5 Alpha is a combination of CD/MP3 player, USB mass storage media player and MIDI software controller. USB 2.0 port for connection of hard disks, USB sticks, etc. Check out Reloop DJ for more details. Novation Twitch Live Translator Novation announced that Twitch - the touchstrip DJ controller - now has a free application that allows Twitch to control parameters and build custom mappings in Ableton Live, and other MIDI-compatible software. Korg Announces Fall Rebates Korg USA has announced a new fall rebate promotion on some of their models. American Audio Encore 1000 & 2000 American Audio has introduced the Encore 1000 and Encore 2000 dual CD/MP3 player/mixer units.